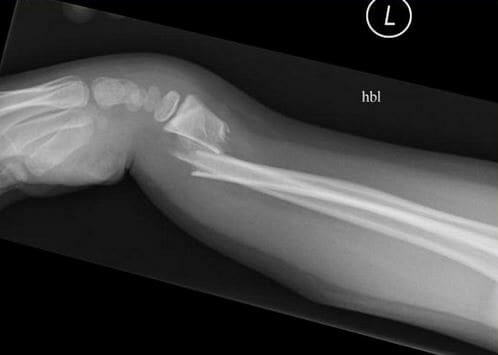 1 What is colles fracture? Colles Fracture, named after and described by Abraham Colle’s in 1814, is a fracture of the distal radius in the forearm with specific dorsal and radial displacement of the wrist and the hand. Basically, it occurs when the radius of the bone in the forearm breaks. The radius is the larger of the two main bones in the forearm. The distal pat of the radius is the end near of the wrist. In a Colles wrist fracture the distal end breaks and can cause the wrist to bend in an abnormal way. The Colles fracture is one of the most common and challenging of the fractures. Depending on the severity of the injury, one may experience pain while moving the wrist. One may not be able to hold or grip anything, and wrist will be swollen bruised. Colles Fracture is often referred as the Colles Wrist Fracture due to the definition of the fracture. Colles fracture is found more often in older people with brittle bones and in children, whose bones tend to be soft. Females are prone to this injury than male. In U.S.A and Northern Europe, Colle’s fracture is the most common type of fracture that women up to 75 years of age experience. It is particularly common in patients with osteoporosis (a disorder in which bones become very fragile and more likely to break). Younger patients are affected by Colle’s fracture mainly due to sudden fall during contact sports, skiing, horse riding etc. Generally in these cases putting the hands out to stop the fall can cause Colle’s fracture. 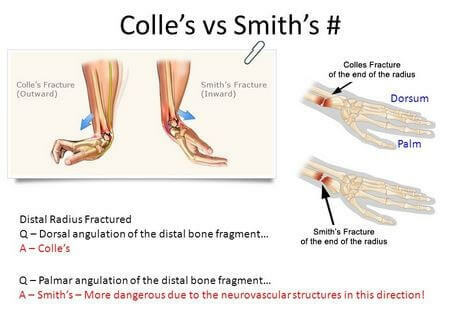 To summarize the entire Colle’s Fracture, it can be said that fracture that results in the wrist is Colle’s Wrist Fracture. Due to age and poor muscle strength. Walking or other activities on snow or ice. The symptoms of the fracture vary according to the severity of the problem. However, the major and most common symptoms are following. There is a change in shape or angle of the forearm noticed in just above the wrist. This can be referred as the “Dinner fork” or “bayonet” likes deformities. Inability to hold or lift any objects. Wrist pain when flexing the wrist. Mainly the preliminary symptoms are a pretty good indication for detecting a broken wrist. Radial angulation of the wrist. Dorsal displacement of the distal fragment. Comminution at the fracture site. One basic thumb rule for treating the broken bone is: the broken pieces must be put back into position and prevented from moving out of place until they are set. There are many treatment options for a distal radius fracture depending upon the nature of the fracture, patient’s age and activity level, and the surgeon’s personal preferences. If the fracture is not severe a plaster cast can be applied. If the alignment of the bone is out of place it may be necessary to re-align the broken bone fragments. In this case, the doctor moves the broken pieces into place. When a bone is straightened without having to open the skin, it is called a closed reduction. After the bone is properly aligned, a splint or cast is placed on the arm. A splint is usually used for a few days which in turn cause a normal swelling. Generally, a cast is added after the swelling goes down. The cast needs to be changed every couple of or 3 weeks. For monitoring the progress X-rays at a regular interval are done. After the removal of the cast, physical therapy is often needed to be started to improve the motion and function of the injured wrist. However, casting may not be the ideal treatment option for every situation. The severity of the bone position may dictate the term of treatment and in severe cases, Surgical Treatment may be opted. The injury becomes so severe that it may cost the future functioning of the wrist. In these cases, surgery is needed. It involves making an incision to directly access the broken bone to improve alignment. This is called open reduction. After the healing process, a number of methodologies can opt for holding the bone. Casting, Metal Pins, Plate and Screws, External Fixator and the combination of all these can be used for the holding purpose. In case of open fractures surgery is required within 8 hours of the injury. The exposed tissues and the bones must be thoroughly cleaned. Either external or internal fixation method will be used to hold the bones in place. Nutrition: Enough intakes of calcium and vitamin D which helps to build up the bones. Exercise: Particular exercises make bones stronger. It cannot be guaranteed always that after a surgery or casting patient will restore full control of the wrist. But the patient should be able to move the fingers after the surgery or casting. After successful surgery or cast, for full recovery of the movement physical therapy is much needed in order to restore the movements of the wrist through a session of certain exercises and physiotherapy. Sometimes due to improper cast and / or negligence, chronic pain will be felt while lifting a heavy object. ← How Long Does Methadone Stay in Your System?